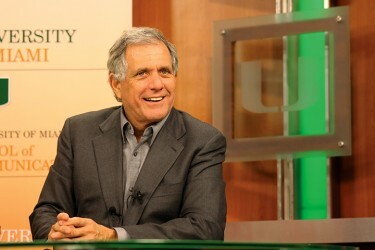 CEO of CBS, Leslie Moonves spoke with student media on Monday afternoon in the School of Communication Studio C.
CBS Chief Executive Leslie Moonves visited campus on Monday and discussed some of his thoughts on the future of broadcast journalism and shared his experiences from the course of his career. Here are some of the highlights from his press conference with student media. In a time when our country is so polarized politically, what does CBS do to stay down the middle and make sure that everything that is reported is neutral and unbiased? I think clearly there is a mandate on the part of CBS News to be unbiased, and there are a lot of people that go into those decisions on what gets on the air, and we’re competing with other networks and other channels and other stations that clearly have a different point of view about what they should do. And that’s okay. It’s a point of view as long as people know what they are getting. CBS has very high journalistic standards, and the two gentlemen that lead our news divisions, Jeff Fager and David Rhodes, are extraordinary journalists … They pay attention … and as you may have heard me say, it’s very interesting when we get mail, and we like this, that says “why weren’t you more critical of the president,” or “why were you so nice to the president?” That means we’ve done our job, and we’ve played it down the middle. ABC and Univision – there was a big thing that came out about their network Fusion, targeting specifically millennials, and we’re curious to know if maybe CBS has any ideas in terms of maybe targeting that same pivotal audience group – whether that be through a digital service online or maybe a cable news partnership as well? Well, we had tried a variety of ideas about doing a cable news partnership, and none of them ever came to fruition. So we’re forming a 24/7 online network because basically we have a huge news organization that services obviously the evening news and CBS This Morning, but there’s a lot of coverage of things that doesn’t ever get on the air so we have a lot of material. Plus, we have a lot of stations, as you know, throughout the country, not only owned and operated stations but other affiliates, so we have a lot of content that can be put on the air. Our idea is to partner with some of the biggest internet providers and to put on a 24/7 news channel that hopefully will appeal to a younger demographic, and that will be the future of CBS News. What techniques, that you’re aware of, do you use to inspire your team? I started very low and worked my way up, and I sort of remember everybody I ever worked for and other people. It’s not that complicated. You treat people the way you want to be treated yourself, and as people are coming in, especially the higher you get, you have to remember that how you treat people is very, very important. There was one time when there was an assistant down the hall, and I was preoccupied and didn’t say good morning to her, and she was very upset about that. I heard later on, and I said I didn’t even notice it. But you have to be mindful that there are real human beings there. And once again, you have to find people that have a similar mindset as you, who are driven to do the right thing. I think leadership is about succeeding while doing it the right way. We’re in a business where it’s very competitive, and sometimes people play very dishonestly. We don’t try to do that. I try to lead by example so that we do things in a very honorable way. And our way of doing business is exemplary and … we have to attract producers who can go anywhere … and we have to provide the best place for them to work – an environment where they feel safe where they can put out their best creative ideas they know.